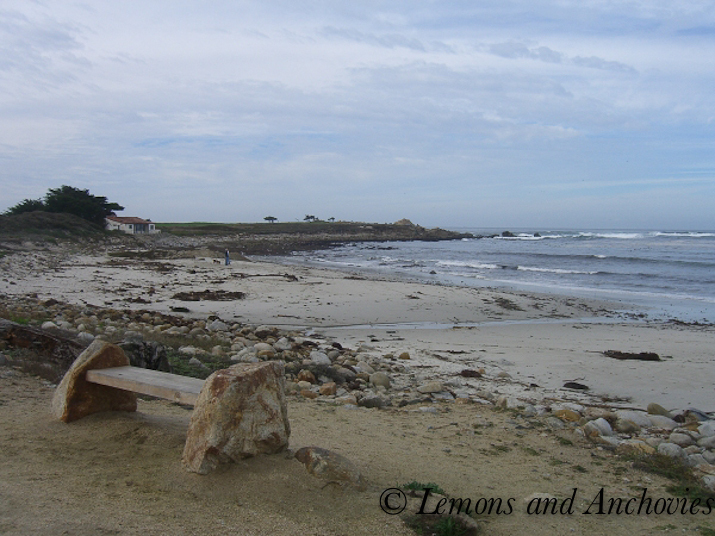 A few days ago, my husband and I escaped to Carmel. 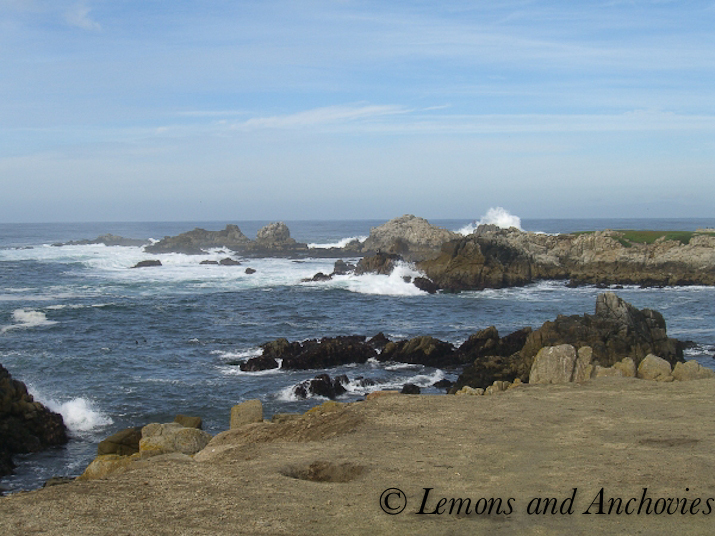 It was a brief getaway, one centered on enjoying vistas like these as we rode our bikes along the coastal route from Carmel to Pebble Beach to Monterey. Though I’ve ridden this route more times than I can remember, I still found myself stopping to take in the stunning views and tried to capture them with my camera..one more time. Can you tell that I love being near the ocean? Rain or shine, whether hot and humid or cold and windy, it’s one of my favorite places to be. Being in the water is probably the only thing better, but the water in these parts is cold! My husband tried to teach me how to surf here a few years ago and even in a thick wetsuit I only lasted a little while. Still, the weather was just right when we visited and more than a few locals showed up to catch some wave action. On our way home the next day, we stopped at a Moss Landing produce stand for some freshly harvested brussels sprouts (still on their stem), a bag of oranges and a couple of bags of fuyu persimmons. The latter were $1/bag–inexpensive, flavorful and the perfect snack for our drive home. Still a little firm, they were wonderful right out of the bag, skin and all. Not to be confused with the acorn-shaped hachiya variety which must be eaten when quite ripe (they can be tart and bitter while immature), fuyu persimmons are round, squat and are edible when firm. I find the right words elusive when trying to describe their flavor. Eaten with the skin on, they’re crisp, the meat smooth and juicy. As you chew, the experience is more like tasting the essence of something rather than being met with the more distinct flavors of, say, a watermelon or a cherry. 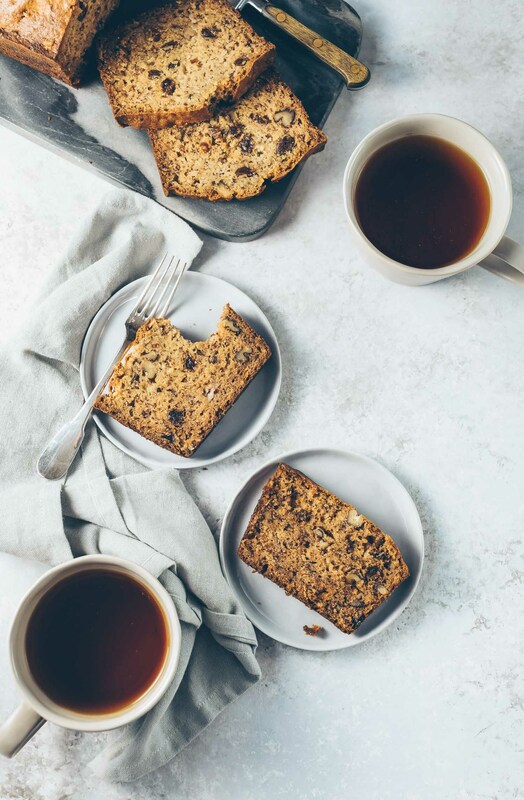 The delicate sweetness, to me a subtle honey flavor, hits you towards the end and you are compelled to take another bite. I’ve eaten them fresh and at times dried (sprinkled with allspice beforehand), but I’ve never baked with persimmons. But two friends, Patty of Patty’s Food and Priscilla of She’s Cookin’ have created some delicious treats out of them. Patty baked Persimmon Muffins with Chocolate Chunks, as well as Persimmon Cookies while Priscilla, equally inspired by Patty, baked these Chocolate Persimmon Muffins. How could I resist trying my hand at enjoying these orange jewels with a baked good? 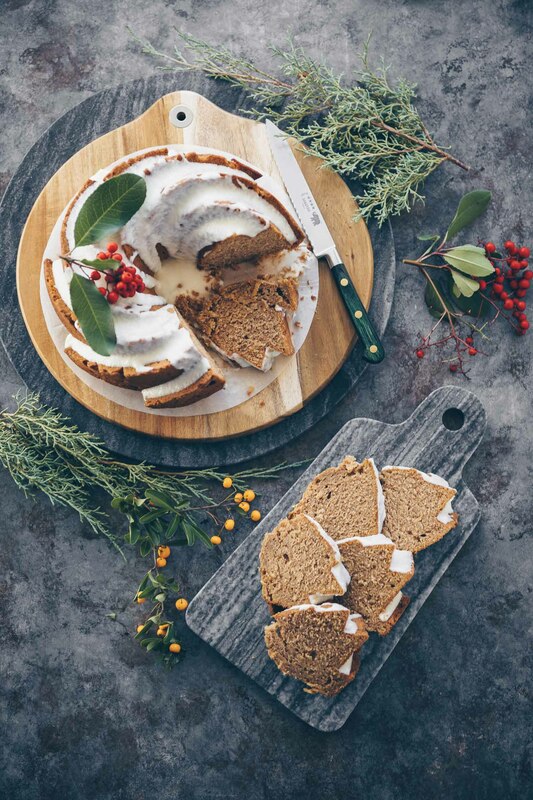 I found this fuyu bundt cake recipe at the California Fuyu Growers Association’s site which I thought would be perfect to try since I also had another special ingredient to use. My dear friend Susan generously sent me a four-pound bag of Natural Extra-Fancy Mammoth Pecan Halves from Sunnyland Farms in Albany, Georgia. These pecans were exceptionally fresh and sweet; I just had to use them in place of the walnuts that were called for in the recipe. I also omitted the raisins (husband not a fan) substituting a handful of chopped, dried cranberries and used allspice instead of ground cloves (none available). Lastly, since my bundt pan was too small to accommodate the batter, I had to use a cake pan but it all worked out just fine. Grease and flour a cake pan and preheat your oven to 350ºF. Stir the baking soda into the chopped persimmons and set aside. Beat the butter and sugar in a large bowl. Add the eggs, lemon juice and vanilla extract and beat until fluffy. Stir in the fuyu mixture. Sift together the dry ingredients and stir into the fuyu mixture just until blended. Add the nuts and raisins (or cranberries if you prefer). Pour into the cake pan and bake for 55-60 minutes. Note: I always use the convection feature of my oven so my cake was done in 45 minutes. Cool in the pan for 15 minutes and continue to cool on wire rack. Combine the ingredients in a bowl and place over a double boiler. Cook until the butter and sugar are melted and the mixture has thickened. Remove from heat and whisk until smooth and cooled down slightly. Drizzle over the cake slices. I have a bowl of persimmons sitting on my counter, but I’ve been so wishy washy about what I want to make with them. Love this cake, the glaze is a beautiful touch! And the spices give it a very holiday feel, perfect for Christmas! 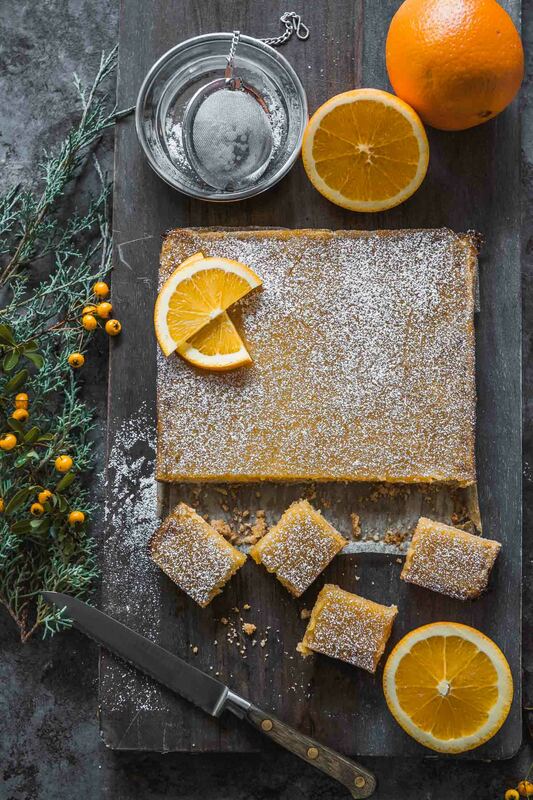 This persimmon cake and the photos of the Pacific coast are just a dream! Love it! 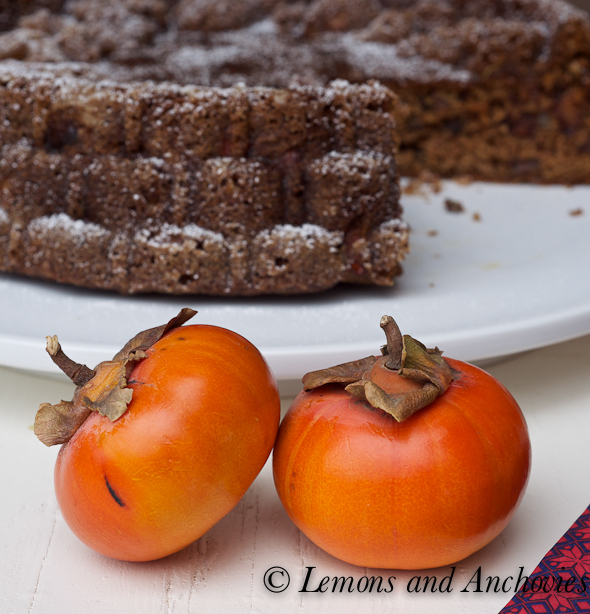 Next time I see persimmons, I will immediately think of your cake and get some to make it. A beautiful cake! My mom always had persimmons when I was growing up but I was too scared to try them (very picky eater!!) A few years ago my CSA box included some and I actually gave them away. Then my Japanese friend used them in a meal that we had at her house and I felt obligated to try. Believe it or not I actually liked them! Don’t really know what to do wtih them, so I haven’t really purchased them but I’m not afraid to eat them any more! I love the ocean too and i’m always captivated by the breathtaking seascape of Torrey Pines in La Jolla that greets me as I drive down daily! I agree with Liren, these spices give a holiday touch to the cake. Love it! In my childhood house I had a persimmon tree and at that time I hated persimmons so much that I just never ever wanted to eat them, despite being free. Now I like them but i still never thought of baking with them either. You ladies are totally inspiring me. I think what really convinces me of this cake is the combination of persimmons with nuts (or pecans). I’m intrigued. And, needless to say but still good to hear, great pictures! Sara, we actually own a persimmon tree, too. Sadly, it’s about 35 miles away from home so I never get to enjoy them. By the time I remember to harvest, an unknown neighbor would have already done it for me! I would love to have a tree in my backyard here at home. And yes, the pecans and cranberries are highly recommended. Hi, Jean – thanks for the mention 🙂 I knew your cake would be fabulous – especially with your special touch of citrus glaze and fresh Georgia pecans – what a treat! The vistas along Carmel-Monterey coast are stunning no matter how many times you see them – thanks for sharing photos from your weekend. I love this post! My grandparents built a home in Pebble Beach before it was ‘PEBBLE BEACH’. We spent alot of time there. In fact I remember many picnics on the beach in your photo with the little house at the end (near Pt. Joe). Such a great memory evoker! Envy all your persimmons right now. Since I stick to what is local that is never on the menu! I’ll live vicariously! Super interesting recipe! Never would’ve thought to put persimmons with these flavors, but it works. Really well. That cake mold is awesome too! Thanks, Chrystal! The recipe was a simple internet find and it works! The cake mold was a a deal from Sur La Table. I was happy to have it since my bundt pan was too small. Hoping you can provide approx dimensions of the cake pan? Great photos, and I’m going to try the recipe this season! Thanks in advance. It took me a while to get up the nerve to try Fuyu persimmons since I grew up eating almost exclusively Hachiyas, which are way more popular in Hong Kong than they seem to be here. NBut now that I’m an old pro at slicing Fuyus into salads, I think it’s time to try baking with them. Thanks for the inspiration, Jean! 🙂 Have a wonderful holiday season! Angi, it’s the reverse for me, not much experience w/ hachiyas. It was nice to find a different fruit to bake with and honestly, I would never have thought of using fuyus myself. What a fabulous cake! I bet it tastes wonderful. Hi! We are baking with persimmons too! 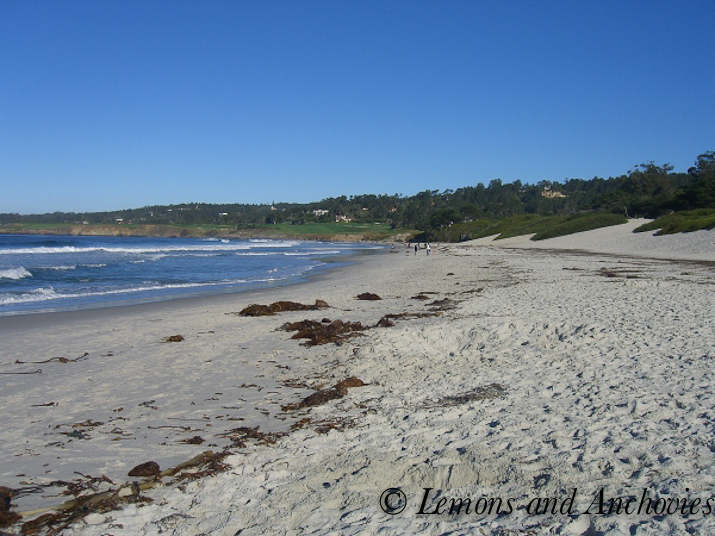 Love your photos of Carmel. And I like the idea of pairing persimmon with pecan! I think permissions are such a beautiful-looking fruit and your cake looks delicious! Absolutely scrumptious. Fruit and nut combos are almost always good. Persimmons and pecans seems such a great idea. Liking the texture of the cake…also those wonderful photos. I must admit I “envy” your possibility of being in the beach with reasonable weather..It is a great recipe! I love cakes full of spices!! That looks wonderful. I love persimmon and anytime I could have it, I do. Thank you for that little description of a persimmon! I have yet to try the little fruits and am always so curious when I see the recipes pop up! Looks like you had a lovely trip.. I’m so very jealous of your proximity to the water! Lovely cake 🙂 Whenever I get to trying persimmons I’ll be sure to try out this cake! I’ve never been a massive fan of persimmons, the flavour was too cloying, too smelly, but I like the idea of them in a cake. Does it taste particularly strong? I feel like the lemon glaze would tone it down a little. Great photos. There is something very calming about being near the ocean. I’m reading some great things about persimmons (both from Patty & Priscilla’s posts) and anxious to give them a try too. I must admit, that I’ve never tasted one before. 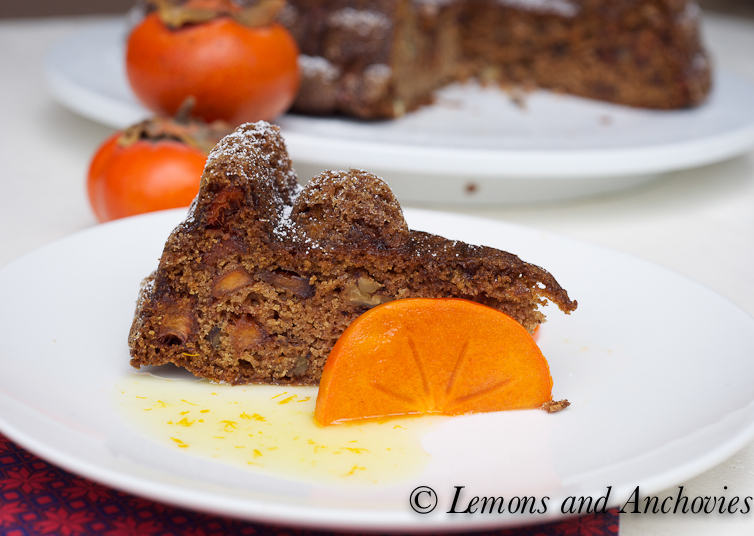 If your fuyu persimmon cake is reminiscent of carrot-cake…it’s a sure winner with me. Hope I can find some in my local mkts before they’re outta season. Looking at those photos makes me miss California. I’m originally from the Bay Area myself and absolutely love that part of the state (Carmel, Monterey). Now I live in Michigan where the snow has not left the ground in 2 weeks. It’s going to be a long Winter. I love persimmons. Though, like you, I have never baked with them either. There’s something about the color of persimmons that instantly gets me in a good, cheery mood. :-p Your cake looked very good and moist, though. Gratz! Never imagined persimmons in cake. My oh my, this a wonderful recipe i would glad to bake for my family! But first and foremost gotta find fuyu persimmons in our maket, now Im craving some. LOL. Enjoy the season! Looks like you had a fabulous birthday trip. Thanks for the photos – they’re so beautiful! I love this time of the year because of fuyu persiimmons (or kaki is what we call them in Japanese). My inlaws have a fuyu persimmon tree but their crop this year was not as bountiful as years past. I love to eat them fresh but I haven’t found a baked recipe that I love. My mother-in-law makes persimmon bread and my sister-in-law makes cookies but I don’t love either… perhaps cake is the answer. 🙂 Yours looks great, and I love the substitutions! Oh I never cooked with persimmons, I only eat them with a spoon when they’re ripe. Your cake is so gorgeous, I love those dark hearty cakes filled with fruits and nuts, and full of wonderful flavors. Magnifique. The photos of the beach are gorgeous! I love seeing all of these wonderful recipes uses persimmons in desserts. The idea of this cake being reminiscent to a carrot cake really caught my attention because I LOVE carrot cake. All of the spices sound wonderful and I love that you added dried cranberries and pecans. So many of my favorite ingredients in one cake. Your cake really looks amazing! I love seeing the water…I miss the beach so much. I’m in land-locked Colorado now, but at least the mountains are beautiful! This cake looks delicious. I love spicy cakes, but I’ve never used persimmons before. I love eating the fruit on its own, so I’m sure it makes a wonderful addition to this cake. This looks like a perfect dessert to serve during the holiday season. Very unique and certainly delicious. I hope that you are having such a wonderful week of holiday celebration. Thanks for sharing, my sweet friend! I love Carmel! This looks like a wonderful cake. Persimmons are so lovely! Happy holidays! What a beautiful cake. I’ve never actually tasted persimmons, so to me, it looks especially exotic. Happy Holidays, Jean! This cake is perfect for the holidays… beautifully festive! Merry Christmas to you and your family!! I would kill a bad person to be able to make a cake that looked that off the chain. 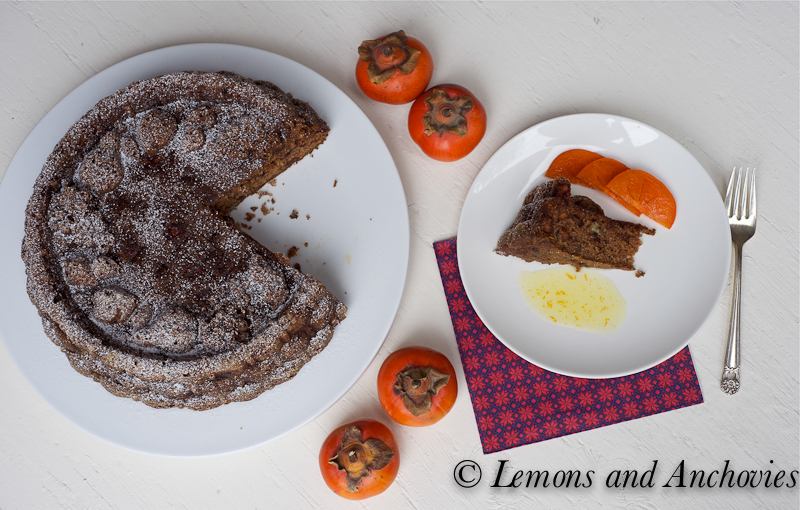 Adding a cake to an already delicious persimmon? Great idea! I was wondering how to use persimmons in a recipe and you had answered my question, will definitely try this out.